Party Mix Lolly Bags come in 100g bags of Fresha and Allseps party mix. 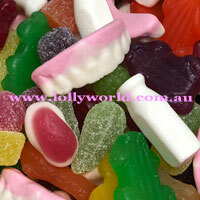 The lollies used are a mixture of jube party mix lollies. For your next party or social function, why not give everybody a bag of lollies! This is an assorted mix of great tasting lollies. The mix contains a random lolly assortment of Milk Bottles, Spearmint Leaves, Fruity Frogs and Snakes. Strawberries & Creams, Laughs, Jubes, and also Mixed Berries. This way everyone gets their favourite lollies in one bag! There is also approx 15 lollies in a 100g bag (This can vary depending on the mix of lollies in each bag). Larger quantities are made to order, so please allow 1-2 days lead time. If you have a deadline please leave a note in your order. Party Mix Lolly Bags come in 100g bags of Fresha and Allseps party mix. The lollies used are a mixture of jube party mix lollies. For your next party or social function, why not give everybody a bag of lollies! This is an assorted mix of great tasting lollies. The mix contains a random lolly assortment of Milk Bottles, Spearmint Leaves, Fruity Frogs and Snakes. Strawberries & Creams, Laughs, Jubes, and also Mixed Berries. This way everyone gets their favourite lollies in one bag! There is also approx 15 lollies in a 100g bag (This can vary depending on the mix of lollies in each bag).